Looking for a bike that does everything? 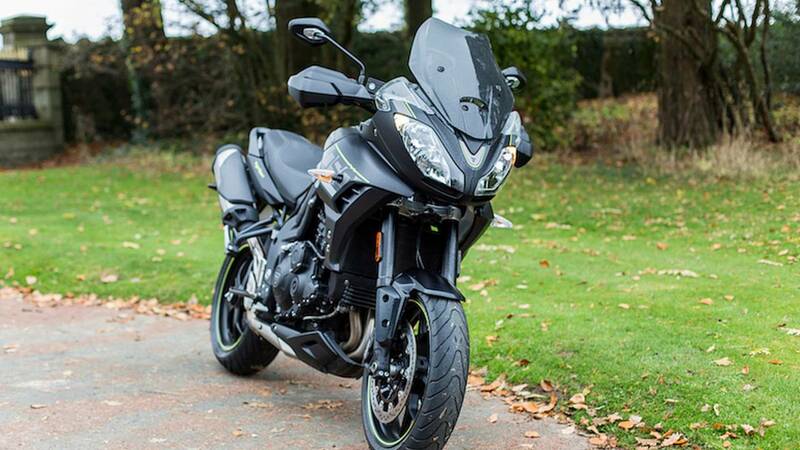 Check out our review of the Triumph Tiger Sport. When my wife was a young girl she collected motorcycle stickers – keeping them in a book, or sometimes displaying them on her bedroom wall. That’s her father’s influence, perhaps. As a college student in the late 1970s he used a mid-60s Bonneville as his sole means of transportation. The Triumph of then was not the Triumph of now, so he found himself replacing parts on a weekly basis, but he loved the bike all the same. 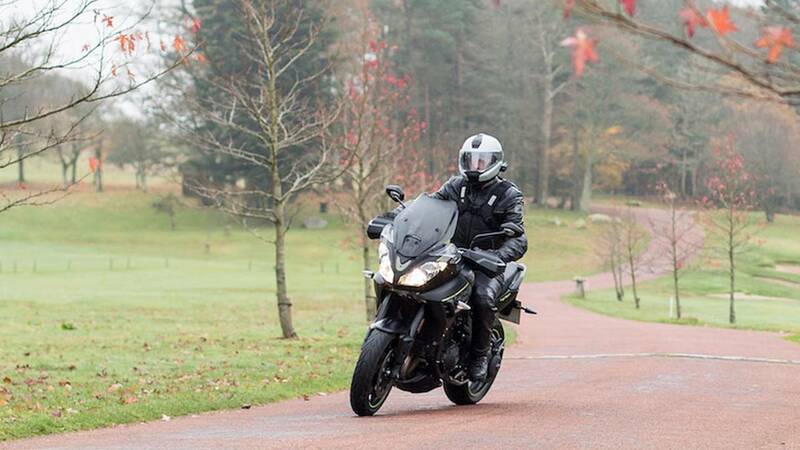 Meanwhile, it’s a running joke in Britain that as soon as spy shots of a new Triumph model surface, the lads at MCN will pencil it in as their Bike of the Year. The brand is the best-selling in the United Kingdom for motorcycles with a capacity of 500cc or greater. And just as you’ll struggle to find a Wisconsin biker who speaks ill of Harley-Davidson, most of the folks in Blighty have only glowing superlatives for the Leicestershire-based manufacturer. 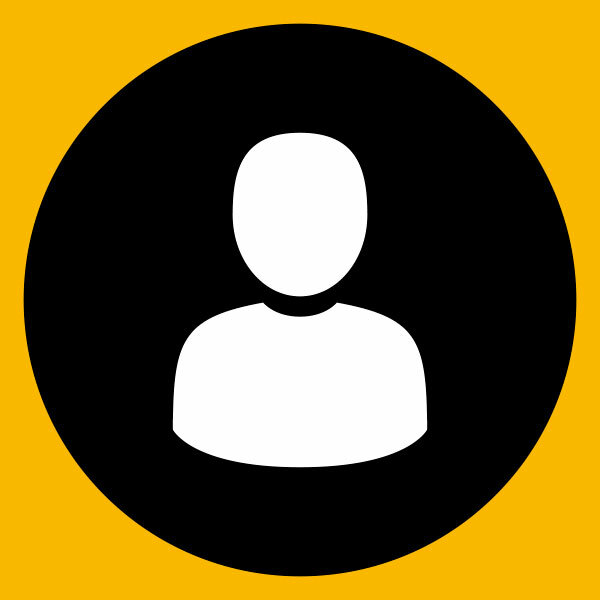 Having lived in Her Majesty’s United Kingdom of Great Britain and Northern Ireland for more than a decade, it is possible I’ve been affected by my surroundings and developed a pro-Triumph bias. I don’t feel that way, though. I think the Tiger Sport is just that damn good: it is one of the best road motorcycles out there today. If you live in the United States – where the Tiger Sport is presently unavailable – this review is going to break your heart. 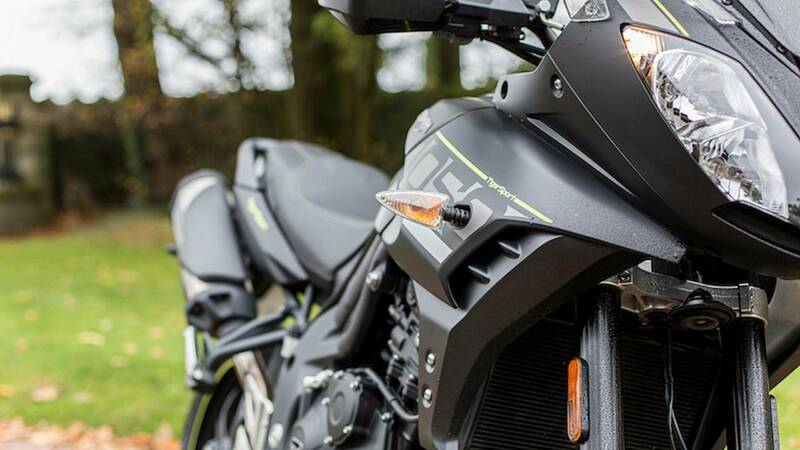 The 1050cc inline-triple-powered Tiger Sport is reportedly the most popular bike on Triumph’s employee purchase deal. In other words, this is the Triumph that Triumph employees are most likely to spend their money on. That tells you a lot. Besides, you don’t see the fairing graphics and silly rim tape when you’re on the bike. And without those things in my immediate field of vision, I fell in love. I only got to spend two weeks with the Tiger Sport, putting just shy of 1,100 miles on its clock, and was genuinely upset when I had to give it back. The Tiger name has been around a while, used on a number of past and present models. In the present day it’s used for the Tiger 800 XR/XC, Tiger Explorer, and Tiger Sport. 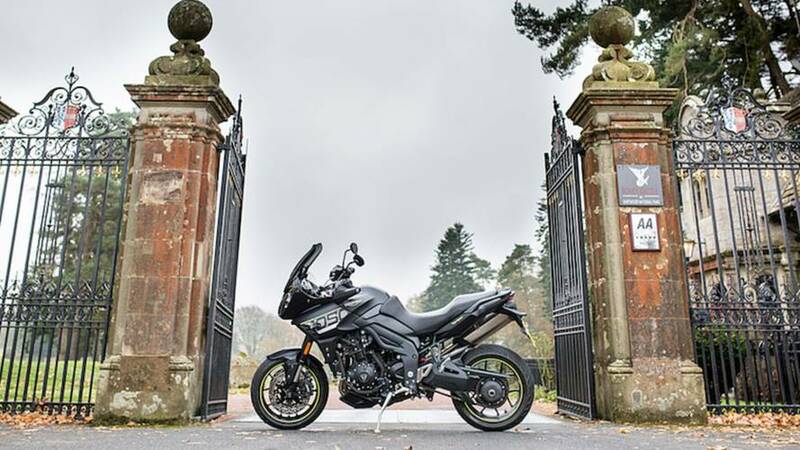 The current iteration of the Tiger Sport can be traced back to 2001, when the Tiger 955i introduced the idea of a Triumph dual sport that had little to no pretension of off-road ability. 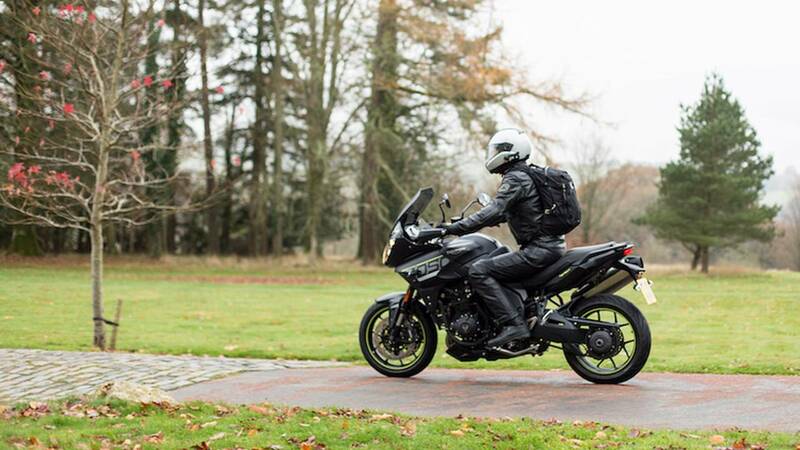 Delivering a claimed 106 horsepower, the Tiger 955i was a harbinger of the current sport-adventure trend – sport tourers with comfy adventure ergonomics. In 2007, an overhaul of the model turned it into the Tiger Sport 1050. For 2016, the bike received a host of style and performance updates, and the “1050” part of its name was quietly dropped (which suggests there will be no 800cc version anytime soon). The presence of 17-inch rims mean the Tiger Sport is made for the road. And with a featherlight clutch, quality suspension, and trademark Triumph flickability you’ll be more than happy to be aboard when roads are of an urban nature. Clutch lever action is so light I initially had a little trouble finding the biting point (the point at which the transmission engages when releasing the clutch), but I figured it out quickly enough and had no complaints thereafter. The seating position (32.6-inch seat height) is upright and gives the rider a commanding view of traffic. Handlebars are wide but not so much that filtering (i.e., lane splitting) is hindered. 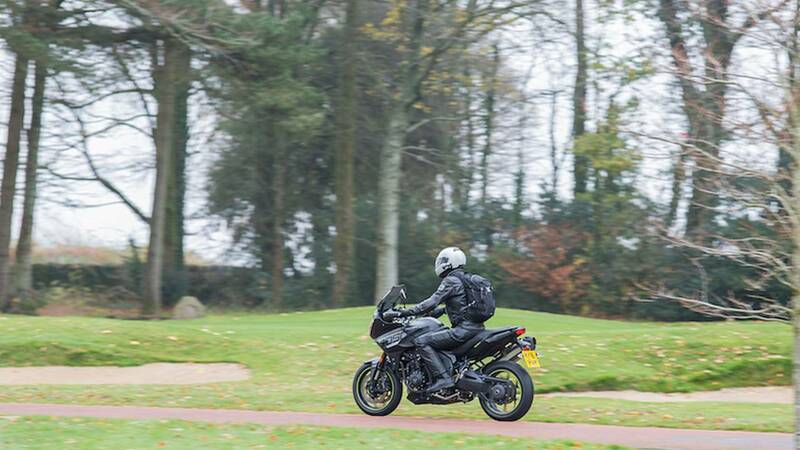 The bike’s not as brilliant as the Street Triple, but it’s close. A very generous second gear means you can get through most city scenarios without ever clicking up or down. 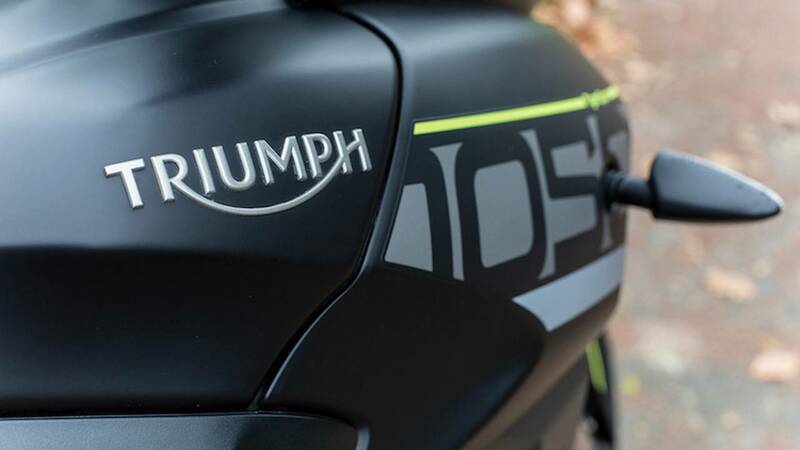 Triumph gives a dry weight of 480 pounds (218 kg), so let’s assume 520 lbs wet (236 kg). That’s the weight equivalent of 26,222 Star Wars figurines, but the Skywalkers are so evenly distributed I was surprised to learn the bike is as heavy as it is; you certainly don’t feel it at low speed. Not at high speed, either. Brothers and sisters, let us join hands now and say, “Thank you,” to the Baby Jesus for giving us cruise control on motorcycles. 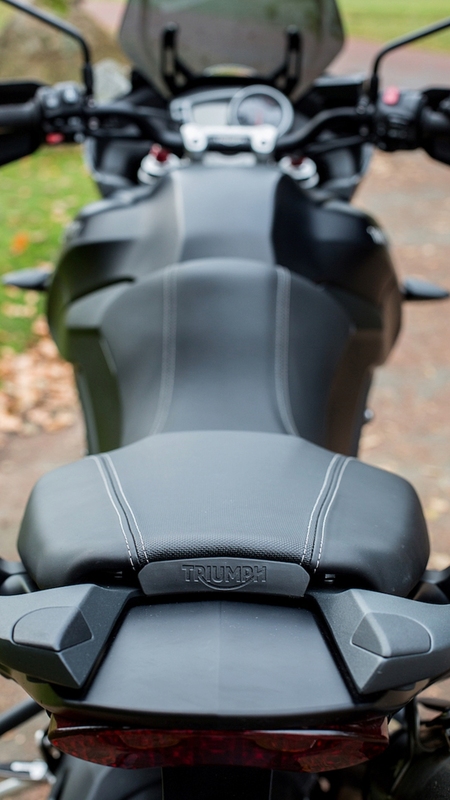 Especially the smooth and accurate system that comes standard on the Triumph Tiger Sport. I have always been dubious about the need for cruise control on a bike, but I realize now that’s because the systems I previously encountered weren’t very good. The set-up on the Tiger Sport requires you to delicately hold the throttle while pushing a button with your right thumb (it would be so much easier if cruise control buttons were on the left grip) but once set it works perfectly. On inclines and even steep hills it manages to stay within 1 mph of your set speed. Photographer Megan is based in my wife’s home turf of Devon, about 130 miles from Cardiff by road. Setting out early on a Sunday morning I was able to avoid the usual traffic that clogs the M4 and M5 motorways and, as such, use cruise control for most of the ride. When I arrived, I was fresh and relaxed and gushing about the fact that, when kept at a constant speed, the Tiger Sport barely even sips from its 5.2-US gallon (20 liters) tank. In steady riding, I consistently managed 210 miles before summoning the fuel light fairy. Cruise control and fuel economy wasn’t the only reason I was happy. 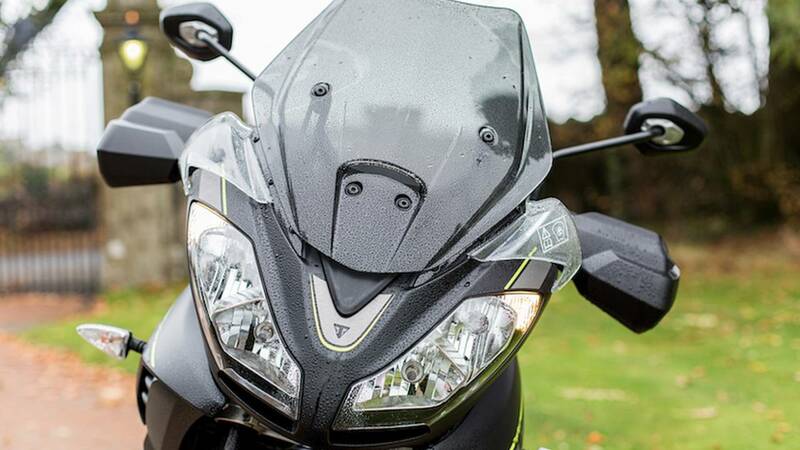 The Tiger Sport’s screen does a great job of keeping foul weather away. Thanks to additional air deflectors on the fairing, the wind pocket is nice and wide; my torso and arms were protected from British December elements. At its highest setting, the easily adjustable screen still let road muck hit my visor but moved the wind so effectively that 80 mph sounded like 40. Handguards come standard and do a good job of keeping wind blast off digits. Too bad heated grips aren’t standard, as well. The seat is big and comfy, with plenty of scooching-around room as well as space for an actual human-sized passenger to sit. Handrails, meanwhile, give passengers something to hold on to, or solo riders something to lash gear to – useful since there is no luggage rack. Cruising along at 80 mph, the engine turns just below 5,000 rpm and is downright car-like in its smoothness. Maybe that’s a backhanded compliment for a motorcycle – after all, if you wanted a car you’d drive a car – but stick with me here. On the boring superslab between point A and point B, a bike with too much “character” can be tiresome and rob you of the energy needed to enjoy point B. The Tiger Sport performs a magic trick of quietly droning along until you get somewhere interesting, then it comes alive. Triumph claims 126 hp (93 kW) at 9,475 rpm, and 78.1 ft lb (106 Nm) of torque at 7,000 rpm. But, of course, numbers don’t really tell you how it feels to twist the throttle. On an abandoned road I decided to see what the bike could do from a dead stop. I whacked the throttle back as far as I dared, banged against the rev limiter (this happens too easily in first), then zipped to second and third in quick succession. As I did this, the bike sprung forward as if jumping into hyperspace. The traction control light blinked, my mind shouted, “WHEEEEEEEEEEEEEEEEEEEEEE!”, and when I eased off at 100 mph I realized I felt a bit sick. The Tiger Sport, when you want it to, can accelerate with such intensity you’ll want to throw up; I can’t imagine needing more power than that. 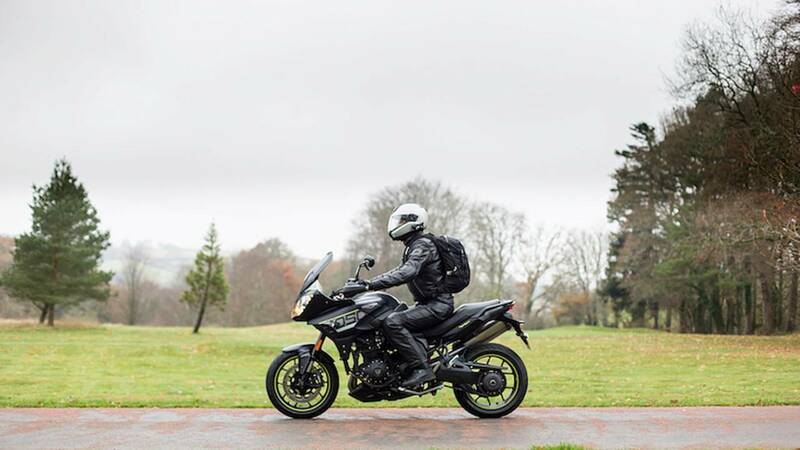 And whereas other bikes in this class (e.g., BMW S 1000 XR) may offer more horses, the ones released by the Tiger Sport are almost instantly accessible. On two-lane highways, passing cars will become your new favorite game. 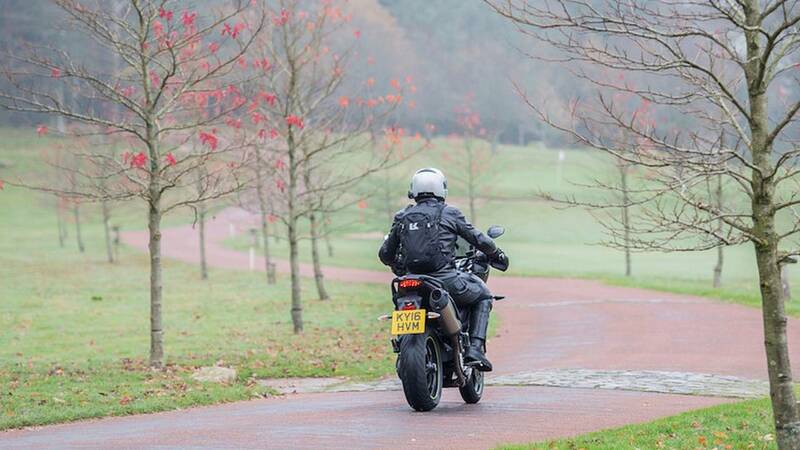 Taking the Tiger Sport on twisty Welsh roads was what really made me a believer, though. The bike dances through corners, feeling agile while smoothing out road imperfections. The triple’s engine braking is light but effective in assisting smooth corner entry; if you overcook it, the Nissin brakes offer plenty of bite. ABS is standard. The engine has a good sound, but it is quiet. This doesn’t bother me at all – I actually like it – because I have little old ladies living on either side of me, but the more obnoxious of spirit would probably opt to purchase an accessory Arrow exhaust. 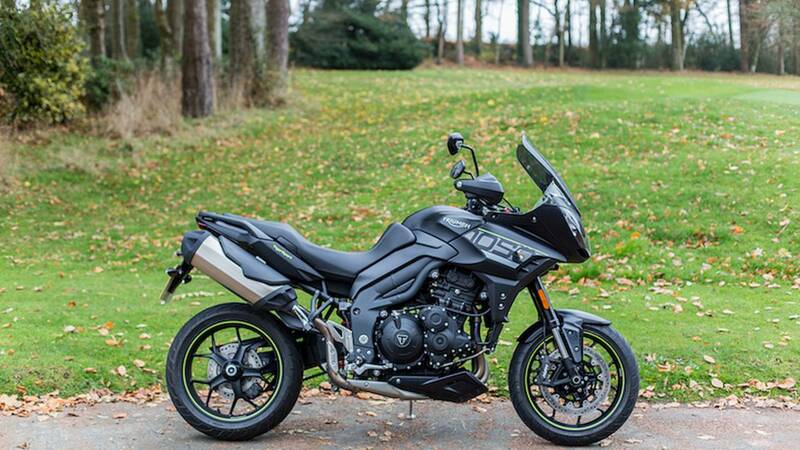 Along with the aforementioned cruise control, ABS, good fuel economy, and comfort, the Tiger Sport is packed with goodies to make a rider’s life easier. Two-setting traction control is incorporated into the bike’s three riding modes: Rain, Road, and Sport. 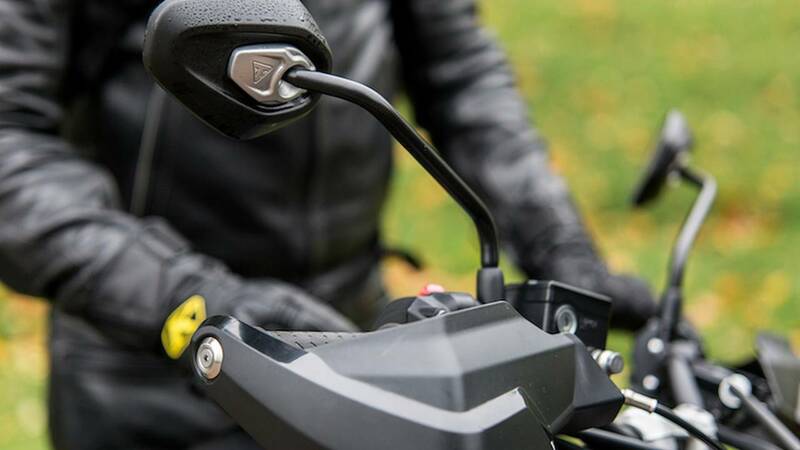 A 12v socket for GPS or heated clothing is cleverly tucked into the fairing, and a USB port is located under the seat. You can set the indicators to be self-cancelling, and the tire valves are angled to make them easier to access. The dash is set up in my preferred combination of digital speedo with analog tach. Within this set-up you’ll also get the information we’ve come to expect from a modern dash: gear indicator, fuel level, engine temperature, clock, two trip meters, current and average fuel consumption, miles until empty, and riding mode. 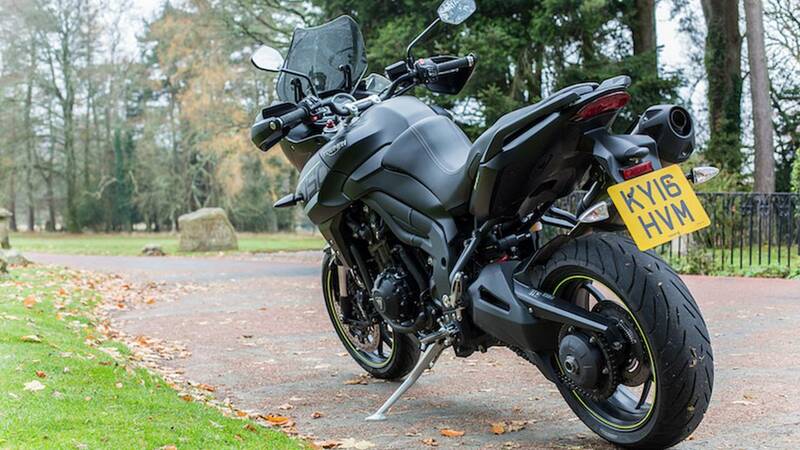 Cleaning this sort of bike is pretty easy – just hit it with a hose – and Triumph claim service intervals of 10,000 miles. If you’re like me, not trusting oil to last that long, you will have to remove the belly pan to get at the oil filter, but this is easily done by unscrewing a set of Allen bolts. You’ll need to fork out extra for a centerstand to make chain maintenance easier on road trips. Accessory panniers make the bike even more practical, with the left side being large enough to hold a full-face helmet. You can also throw down the dough for a top box that contains an additional 12v socket, but that will spoil the lines of the bike somewhat. All in all, though, the Tiger Sport reminds one of the John Burns observation that Triumph these days is managing to out-Honda Honda. The headlight could be brighter. However, it may be that the model I rode had been set to keep the beam low and things could be improved simply by tweaking headlight angle. That shouldn’t be too difficult; all of the Tiger range have the world’s easiest bulb-changing system, so presumably adjustment is equally hassle-free. The controls for navigating dash information are split between two buttons on the dash itself and another button on the left grip. I have never found Triumph’s menus to be intuitive, but every time I point this out Triumph fans insist I’m a moron, so maybe it will make complete sense to you. 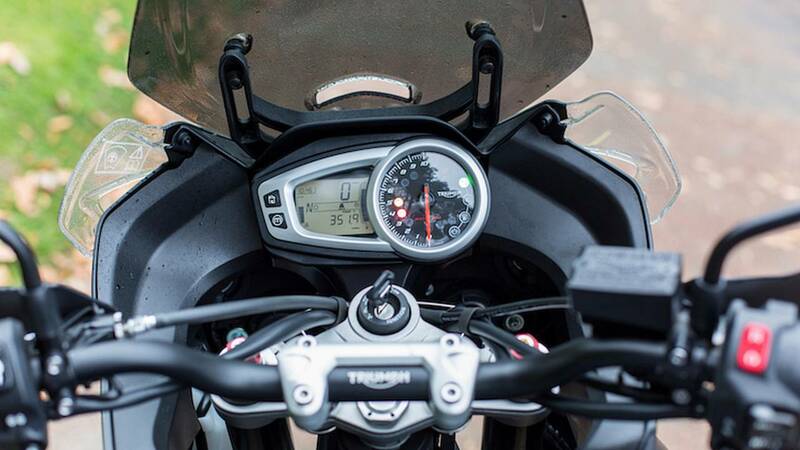 Speaking of the dash: its face is the same used on the Tiger 800 XR/XC and the set-up looks tiny within the context of the Tiger Sport’s fairing. That I’m even bothering to write this complaint, though, is a sign of how otherwise perfect the bike is. All other complaints have to do with the fact that certain accessory items aren’t standard. Heated grips, and especially a centerstand, should be part of the package. The Tiger Sport is made in Hinckley, England, at the same factory where I picked it up and returned it. Many of Triumph’s other models are made in its factories in Thailand and Brazil, so that this one is made “at home” gives it a feeling of being extra special. Maybe that’s another reason Triumph employees choose it over other models. Maybe it’s also why those employees have lovingly equipped the bike with dozens of unique little touches. Branded mirrors, footpegs, seat, and so on show a real attention to detail. 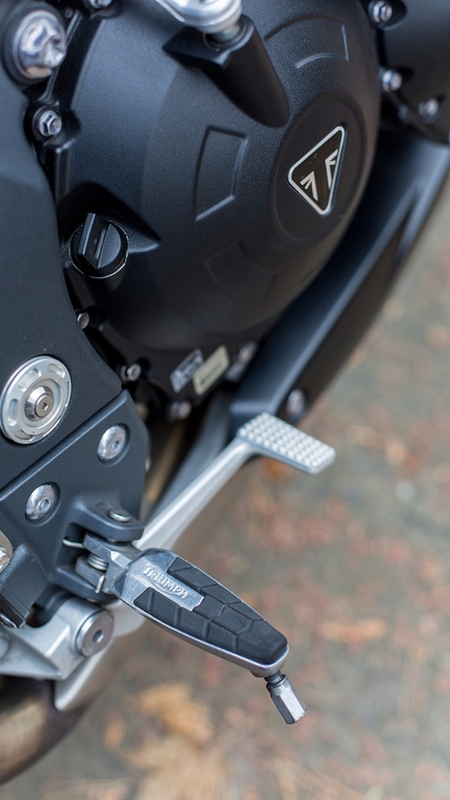 These subtle touches not only give the bike a feeling of quality far in excess of competitors like the Yamaha FJ-09 (aka Tracer 900), Kawasaki Versys 1000, or Suzuki V-Strom 1000, they also suggest that whoever designed this bike really cared. He, she, or they thought about how the bike would, should, and could be ridden and managed to deliver a bike that is so much better than you’d ever suspect. 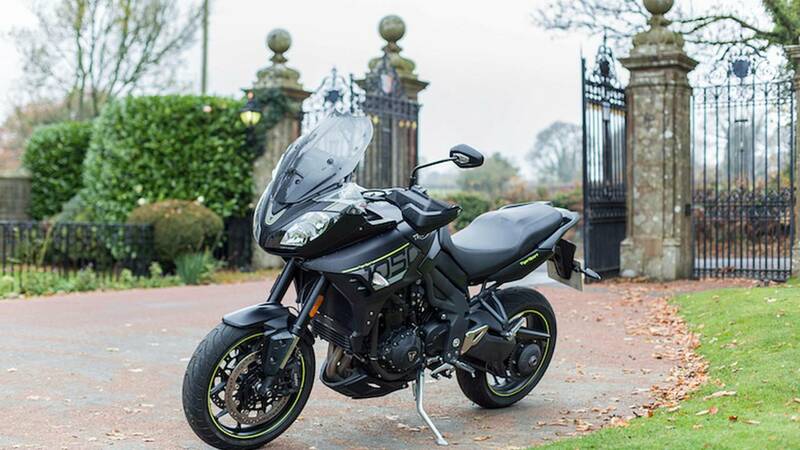 In its native UK, the starting price on a Tiger Sport is £10,700 (or about US $13,300). That puts it in the middle of the bikes one might consider as a competitor – more than the Yamaha, Kawasaki, or Suzuki, but less than the BMW, Honda VFR1200X, Ducati Multistrada 1200S, or KTM 1290 Super Duke GT. Considering all you get for the money, I’m inclined to believe the Triumph is fairly priced. Because I’m a bike nerd, I tend to fall in love with almost every motorcycle I ride and will spend at least a day or two thinking, “I need to get me one of them,” but uniquely that feeling is sticking around far longer in the case of the Tiger Sport. In fact, it’s grown more intense with the passage of time; each day I feel I’m missing out by not having the bike in my garage. I’ve been thinking a lot about heading down to my nearest Triumph dealership early next month to see if I can get a good deal on a model registered in 2016. We’ll see what happens. It naturally follows, then, that I’ve recommended the bike to a friend who is presently in the market for just such a machine. His daily commute is about 60 miles each way, so he needs something that’s good for eating up distance, but he lives in Scotland – home to some of the UK’s best scenery – so he needs something that’s adept at getting the most out of a landscape. To me, that’s the Tiger Sport. There is no perfect bike, but, golly, this comes close.